Pack size: 20 x 0.35ml vial. Review Blink Contacts Vials The best eye drops for dry eye and post eye surgery! Perfect to put in the handbag or purse! Review Blink Contacts Vials Always handy to have, particularly when it has been a long day or the pollen count is up. Much better to have individual vials rather than a eye drop bottle that ends up been thrown away once opened for too long. Review Blink Contacts Vials Really useful to carry about in a bag or pocket. My son keeps a couple in his schoolbag for days when the air-conditioning is drying his eyes out too much. Review Blink Contacts Vials I find these really help when my eyes feel really dry in air conditioning, or at the end of the day and in sunny climates. Review Blink Contacts Vials Like these a lot, very handy. Review Blink Contacts Vials easy to use and carry, good for contacts. Review Blink Contacts Vials They do the job. Review Blink Contacts Vials Really convenient to carry around. No worries about thowing away unused drops as in individual vials - each vial provides 7-8 drops. Really comfortable when used with soft lenses. Refreshing. Excellent value for money. Review Blink Contacts Vials Very good product the quality is amazing. I followed the directions and voila it felt like i had a new set of eyes. Does exactly what it says it does. Excellent product will order again. Very fast shipping to the US. Thanks again Vision Direct. Review Blink Contacts Vials Excellent product, safe & fresh eyes when you need it! Review Blink Contacts Vials Really refresh and instantly get rid of any discomfort I might be experiencing from my contact lenses. Would recommend these blink eye drops. Blink Contacts Vials Great eye drops, I was using the bottled version for a while but I find the vials are much easier to carry around and apply! Review Blink Contacts Vials I use this product when wearing my lenses for longer periods or if my eyes feel dry and I find it to be good. I think it is quite expensive, particularly as you often do not use all of the product in the vial and it is wasted if you do not then use the rest within a few hours but it does help if your lenses are not feeling comfortable that day. Review Blink Contacts Vials These are great if my eyes get a bit dry or tired during the day and my lenses start to bother me. These drops help a lot. Very handy! Review Blink Contacts Vials These are a really useful product that help to refresh your eyes if they are feeling dry and tired. Whilst only using them occasionally I have found them useful when temporarily working in a very dry environment such as an excessively hot air conditioned office. 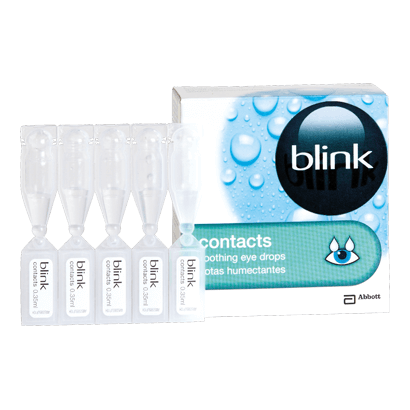 Review Blink Contacts Vials Comfortable and eyes clear quickly so no fuzzy vision. Blink Contacts Vials I prefer these to the bottle. They fit into every purse and you just need to use one vial to sort out your dry eyes. Blink Contacts Vials These are perfect to take on a plane! My eyes tend to get really dry because of the air-con but blink vials help counterbalance that. Blink Contacts Vials ease irritation, discomfort and vision problems associated with dry eyes. The vials contain the globally popular Blink moisturizing solution produced by AMO, which replicates the soothing function of human tears. Stored in handy vials, which can be kept on hand for when they are needed, the Blink Contacts Vials are the ultimate in vision-restoring, comfort-inducing contact lens care. Comes in 20 handy sized vials which each carry a dosage of 0.35ml, enough to rehydrate tired, dry eyes when it is necessary. Dry eyes can be horrible in work situations. With dry, warm conditions the norm in offices and conference rooms, dryness is always around the corner. But with Blink Contacts Vials, you can have a convenient solution to hand whenever hydration becomes a necessity.